18 December 2005: In an age when local governments in general, and urban local governments in particular, have been subject to increasing fiscal stress as a result of receding federal and state aid together with a more regulatory environment that has made municipal management more complex, the council-manager system has risen to dominance in the United States. In a council-manager system, policymaking is vested in elected representatives and management in an appointed professional manager. The increasing application of the council-manager form of government, an innovation first implemented in the early 1900s, has led to increasing research into why this change is taking place. In effect, it means a changeover as the mayor-council form has historically been dominant. However, western and southern regions have historically been areas of council-management. Hence, in Texas, now the second most populous state in the US, by mid-1994 some 251 out of 290 home rule cities were using the council-manager form, which included San Antonia and Dallas - but not Houston. In Texas, by 1947, there were 58 council-manager cities. In California, the most populous US state, out of almost 500 cities, over 400 applied the council- manager system. These include the cities of Sacramento, San Jose, Long Beach and Anaheim. In March 2004, in Oakland, California, there was a rare change back to the mayor-council form under Mayor Jerry Brown, who having once been the Governor of California, found a council-manager system inhibiting and pushed for a change. In North Carolina, the state with the highest proportion of AAA-rated local governments, the council-manager form has been a staple that has facilitated the management of its unique local government finance monitoring system. The largest city in the state, Charlotte, is also recognized as being the country’s leading innovator. Council-manager government was conceived in response to entrenched one-party political machines that had dominated many city governments by the beginning of the 20th Century. During that period, party politics and corruption prevailed and were perceived as being an impediment to fair local government. Partisan elections, dominated by local political machines, limited candidates to party regulars and patronage systems prevented qualified people from serving in local government leadership positions. Staunton, Virginia, in 1908, first legally defined, by ordinance, the broad authority and responsibility associated with a professional local government manager. In 1912, Sumter, South Carolina, became the first city to adopt a charter incorporating the basic principles of council-manager government. In 1914, Dayton, Ohio, became the first large city to adopt the plan. In the 1930s, the first counties to adopt the form were Arlington County, Virginia, and Durham and Robeson Counties in North Carolina. This form was also implemented in the north-east. In 1949, the city of Worcester, Massachusetts, adopted it  a place where there was widespread perception of corruption in City Hall, with city politics reflecting partisan rivalries. This was accompanied by the reality of the City’s long neglected crumbling infrastructure due to legislative squabbling on decisions over which neighborhoods should benefit from construction projects. In the US, most communities adopt the council-manager government through a charter, a local ordinance, or a state enabling law. From these early beginnings, the council-manager form has become the most popular type of government in the United States in communities with populations of 5,000 or more. The form has also found favor outside the United States. In 1913 Westmount, Quebec, first introduced it. It has also been applied in Australia, the Netherlands, New Zealand, the United Kingdom, Honduras, Chile, and Brazil. In the council-manager form, policymaking is vested in elected representatives and management in an appointed professional manager. The mayor, or chairman, of the council and council members are the leaders and policy makers elected to represent the community and to concentrate on policy issues that are responsive to citizens’ needs and wishes. A manager is appointed by the governing body to carry out policy and ensure that the entire community is properly served. If the manager in question does not respond to the governing body’s wishes, it has the authority to dismiss that manager at any time. The formulation of the council-manager form has evolved over time. Originally, it included a ceremonial mayor elected by the council, with a small number of city councilors who were all elected at-large. Today, the way in which councilors are elected varies. Some are elected at=large while others are elected by district; or there is a combination of an at-large and by-district structure. In some local units the mayor or chairman is elected at-large by the voters. In others, the council may elect them. Supporters of this form have asserted that some of the strengths characterized by it, as opposed to a strong mayor form of government, are that: all council members have equal rights, obligations and opportunities. And with the power assigned to the council as a whole, the city manager must be both responsive and accountable in relation to providing day-to-day public services. According to a 1996 survey by the National Civic League (established in 1894 to make local government more honest and accountable) of municipal forms of government, 61 per cent of council-manager cities have popularly elected mayors. 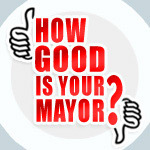 Among council-manager cities with elected mayors, the power of the office of the mayor varied greatly. In 11 per cent of council-manager cities, the mayor is also granted veto power. Some mayors have agenda-setting power, while others serve primarily in a ceremonial role. More than 80 per cent of all cities (mayor and manager) in the survey reported having appointed a chief official, like a city manager. This means that many mayor-council cities have a city manager-like chief administrative officer who answers to the mayor or the council. In the other cities, the mayor administers the day-to-day operations of the government. A growing number of mayor-council cities have begun adding a new professional position, that of city administrator or chief administrative officer (CAO) in the mayor's office. CAOs serve under the mayor and assist with the mayor's administrative and policy-related responsibilities. Generally, this position may be responsible for budget preparation, personnel administration, and the daily supervision of departments. Theoretically, the role of a CAO frees the mayor from the minutiae of administrative details to allow the mayor to concentrate on policy development and political leadership roles. As this framework borrows characteristics of both the council-manager and mayor-council forms, local government observers have suggested that this trend represents a fusion of the two dominant forms of government. Among the large cities to have adopted this form are New York, Los Angeles, Philadelphia, San Francisco and New Orleans. The International City/County Management Association (ICMA) was started in 1914 by a group of appointed managers who formed a professional association to share their expertise and experiences in local government management. In general, the trend toward growing popularity of professional management reflects not only the growth in the number and complexity of local government services, but also the growing demands placed on local governments, both large and small, in the form of federal and state mandates and reporting requirements. In fact, the growth in external demands, in particular, may also be a primary reason for the growing number of smaller mayor-council cities that have also hired professional managers. North Carolina’s trend in this direction has been a precursor since in the aftermath of its implementing a monitored local government finance system in the early 1930s, local governments within the state have tended to opt for professional managers as their size increased the complexity of their operations. Hence, the mayor-council form by the mid-1990s was dominant in North Carolina cities with populations of less than 2,500. On the other hand, the council-manger form is dominant in cities with populations between 2,500 and 25,000. It is applied exclusively in large cities with populations over 25,000. In this era of ever increasing demands on local government, the trend towards the growing use of professional managers, either with CAO positions in mayor-council cities or council-manager frameworks, is destined to continue.